Three Silver Medals were captured during the Finals. The first medal for the Warwick Academy team came during the 15-16 Women’s 50 Yard Backstroke, as Logan Watson-Brown captured the Silver Medal with a time of 27.56. Watson-Brown would win her second Silver Medal of the meet when she touched the wall in a time of 24.12 during the 15-16 Women’s 50 Yard Freestyle Final. 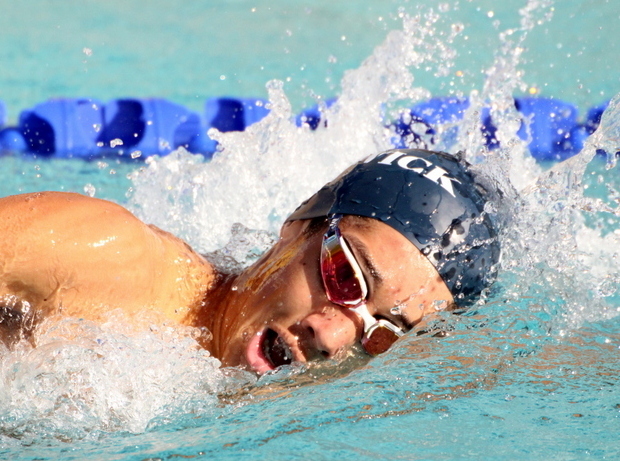 The third Silver Medal would come during the 15-16 Men’s 500 Yard Freestyle Final when Brian Desmond clocked a time of 4:41.21. Taylor White finished 4th in the 13-14 Women’s 100 Yard Butterfly Final clocking a time of 1:00.56. Watson-Brown finished 4th competing in the 15-16 Women’s 100 Yard Butterfly Final when she was clocked in a time of 57.51. Brian Desmond finished 8th during the 15-16 Men’s 50 Yard Backstroke Final touching the wall in a time of 25.67. During the 13-14 Women’s 200 Yard IM Final White finished 10th with a time of 2:17.59. Jack Harvey would finish 8th during the 15-16 Men’s 200 Yard IM Final with a time of 2:01.43. Skyler Powell finished 8th during the 15-16 Women’s 500 Yard Freestyle Final clocking a time of 5:14.79. Earlier in the day the swimmers compete in Preliminaries. Taylor White advanced to the 13-14 Women’s 100 Yard Butterfly A Final when she finished 9th with a time of 1:02.42. Logan Watson-Brown finished 5th in the 15-16 Women’s 100 Yard Butterfly heading to the A Final when she touched the wall in a time of 58.82. Watson-Brown will also head to the 15-16 Women 50 Yard Backstroke A Final, this after she finished 2nd clocking a time of 27.64. Tayla Horan finished 21st stopping the clock in a time of 31.16 while competing in the 13-14 Women’s 50 Yard Backstroke, Gabriela Pitman finished 18th touching the wall in a time of 29.99 and Talia Thompson finished 29th clocking a time of 30.96. Horan finished 19th competing in the 13-14 Women’s 50 Yard Freestyle when she was clocked at 26.40. During the 15-16 Women’s 50 Yard Freestyle, Watson-Brown reached her third A Final when she clocked the second fastest time of 24.29, while Powell finished 14th with a time of 25.38, Pitman finished 15th clocking 25.41 and Thompson finished 49th with a time of 26.91. Caleb Ingham finished 17th competing in the 15-16 Men’s 100 Yard Butterfly clocking a time of 55.73. Zebedee Wakely finished 15th competing in the Men 17 & Over 100 Yard Butterfly touching the wall in a time of 53.83, Joshua Thorne finished 21st clocking 55.97. Brian Desmond advanced to the 15-16 Men’s 50 Yard Backstroke final after clocking the 4th fastest time of 25.54, while Jack Harvey finished 13th clocking a time of 26.72 and Ingham finished 25th with a time of 27.75. During the Men 17 & Over 50 Yard Backstroke, Thorne finished 17th with a time of 28.55, while Wakely finished 18th clocking 28.63. Harvey advanced to the 15-16 Men’s 200 Yard IM clocking the 10th fastest time of 2:01.50. During the 15-16 Men’s 50 Yard Freestyle, Ingham finished 12th with a time of 22.54, Desmond finished 17th stopping the clock in a time of 22.97, while Harvey finished 55th with a time of 24.37. Wakely finished 20th competing in the Men 17 & Over 50 Yard Freestyle clocking a time of 22.81, while Thorne finished 31st with a time of 23.43 and Lewis Sweeney finished 46th with a time of 24.30. With a time of 4:44.70 saw Desmond advance to the 15-16 Men’s 500 Yard Freestyle Final with the second fastest time.